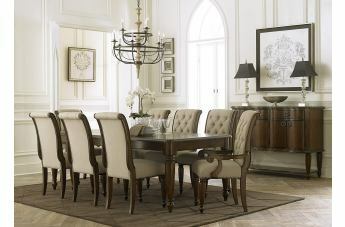 This transitional dining collection will add a romantic style to you home while also being functional. 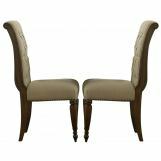 Expertly crafted from fine cherry veneers and poplar solids each piece carries a warm cinnamon finish for an inviting and cozy look. 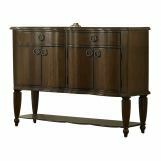 Serpentine shaped fronts are adorned with custom pewter drop ring and back panel hardware for a touch of traditional design. 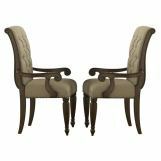 Button tufting on linen upholstered dining chairs are paired with elegantly scrolled arms and turned legs to take you formal dining room to the next level. 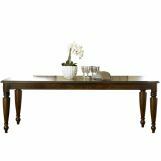 Complete a home you are proud to show off by using select pieces from this gorgeous collection.